Nitrogen cycle as we are familiar is the continuous exchange of nitrogen between the atmosphere and the biosphere. However, the atmosphere encompasses large reserves of nitrogen, most of the plants and animals can't utilize it in the elemental form. 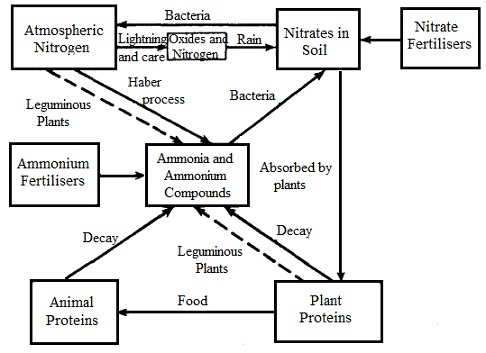 Plants can utilize nitrogen in the form of ammonium salts or as nitrates, thus atmospheric nitrogen has to be transformed to this form or 'fixed' in such a way that plants can utilize it. One means of nitrogen fixation is through lightning discharges in the atmosphere, when nitrogen gels transformed to nitric oxide and then to nitric acid. This nitric add is washed down via rain into the soil, where it is neutralized via lime present in the soil to form the calcium nitrate. There is as well a biological means of nitrogen fixation. Certain bacteria, both free living or symbiotic, convert atmospheric nitrogen to ammonium salts. In the latter class is Rhizobium that lives in the root nodules of leguminous plants such as peas, beans, soya and so on. Such bacteria are termed as nitrogen fixing bacteria. It has been estimated that around 90-175 x 106 tonnes of nitrogen is fixed biologically per year. The equivalent figures for industrial fixation are around 85 x 106 tonnes per annum. The ammonium salts and nitrates are taken up from the soil via plants that convert them to proteins and nucleic acids, necessary components of all living beings. From plants these are passed on to the herbivores, the animals that live on plants and then on to the carnivores all along the food chain. Whenever the plants and animals die, their bodies decay, the nitrogenous compounds in their bodies get decomposed to ammonia and ammonium compounds by ammonifying bacteria present in the soil. The ammonium salts are transformed to the nitrites by nitrosifying bacteria, and the nitrites oxidized to nitrates via nitrifying bacteria. The alternate path-way is the conversion of nitrogenous compounds to elementary nitrogen via denitrifying bacteria. Discharge of nitrogen to the atmosphere, in a manner, completes this cycle. To meet the requirements of the increasing world population, agricultural productivity requires to be increased. Whenever the same soil is cropped intensively year after year, it gets depleted in nitrogen content that should be supplemented by artificial fertilizers to improve production. Moreover to the fertilizers there is as well a great demand for other nitrogen compounds such as polymers, explosives and so on. To meet such demands, we have to draw on the atmospheric nitrogen. Atmospheric nitrogen can be fixed artificially via a diversity of methods. One significant method for the fixation of nitrogen is its conversion into NH3 by Haber method. The formation of calcium cyanamide is the other such method. Calcium cyanamide is obtained via passing atmospheric N2 over calcium carbide at 1400 K.
It is as well employed as a source of organic chemicals like melamine. We can notice that the conversion of atmospheric nitrogen into ammonia via Haber process and by Cyanamide method is expensive as these processes require the use of high temperature and pressure. Thus, considerable research is going on to discover the catalytic reactions that will convert nitrogen into ammonia under normal conditions, as in the situation of the biological methods. As Ca(H2PO4)2 is water soluble, this mixture is a more effective fertilizer than the phosphorite rock, therefore, the name superphosphate. There are other phosphate fertilizers as well, example: a mixture of (NH4)2HPO4 and CaHPO4. In the manufacture of steel, a by-product phosphatic slag is obtained. This slag is as well a very good fertilizer. As usual, nitrogen, the first element of group 15 varies considerably from rest of the family members. Such differences are due to the small size of nitrogen, its high electronegativity, tendency to form stable multiple bonds and non-availability of d-orbitals in the valence shell. The elemental form of nitrogen is a stable gaseous molecule, N=N, while other elements exist as solids. In the gaseous state, P, As and Sb exist in the form of tetra-atomic molecules, P4, As4 and Sb4. This is due to the fact that the bond energy of triply bonded nitrogen is much higher than that of phosphorus, that is, EN=N >> EP=P; however the reverse is true for the single bonds EP-P >> EN-N.
Nitrogen is extremely inert as a consequence of the high bond strength of N=N. The heavier elements are, though, comparatively more reactive. Nitrogen shows a large number of oxidation states like -3, -2, -1, 0, +1, +2, +3, +4 and +5. Other elements don't show such a diversity of oxidation states. Apart from for NF3, the halides of nitrogen, NCl3, NBr3, NI3 are unstable and highly explosive. The halides of other elements of this group are quite stable. The oxides of nitrogen are gaseous, while the oxides of phosphorus, arsenic and so on are solids. Nitrogen can't expand its octet, while phosphorus and other elements can; the latter elements can, thus, have coordination numbers more than four. Therefore, compounds such as PF5, PF6 have no nitrogen analogues. This has other effects as well on the chemistry of nitrogen; for illustration, hydrolysis of NCl3 is slow and yields a diverse product from the hydrolysis of PCl3, which is fast. As nitrogen is one of the most electronegative elements, it extensively enters into hydrogen bond formation. The other elements having comparatively low electronegativity don't form hydrogen bonds.